Nathaniel, whose bold sartorial choice became the enduring symbol of America. PHILADELPHIA—Historians at the University of Pennsylvania announced the discovery this week of a personal diary from the late 18th century that reveals the first U.S. flag sewed by Betsy Ross was originally intended as a shirt for her flamboyant gay friend Nathaniel. 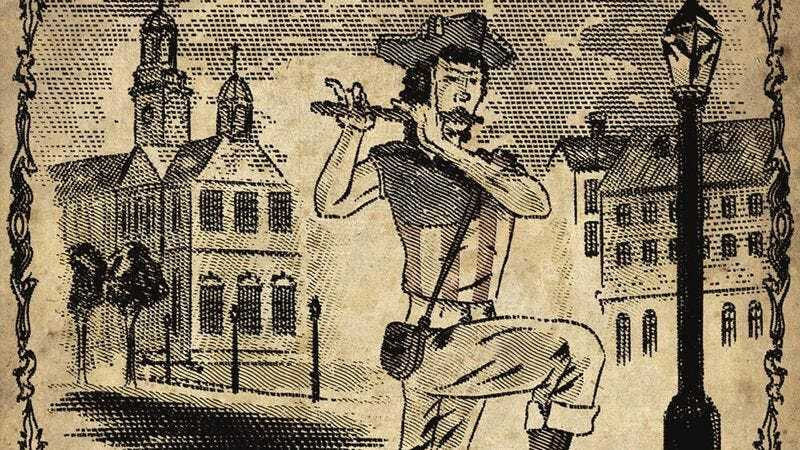 "This has completely upended the accepted narrative behind the first American flag," said historian Kenneth Atwood, who led the team of scholars analyzing the long-forgotten journal of prominent Philadelphia homosexual Nathaniel Linsley. "Now we can say with certainty that our nation's most enduring symbol of freedom, strength, and prosperity is actually just the result of Nathaniel's desire for a sassy, tight-fitting top." "We've all been taught that the 13 stars and stripes of the first U.S. flag represented the original 13 colonies, but this is simply not the case," Atwood added. "In fact, Nathaniel thought that stripes were slimming, and he just really, really liked stars." Millions of schoolchildren across the nation proudly salute Nathaniel's flamboyant garment every day. As his diary attests, Linsley was a collector and dealer of footstools and divans, and was often seen about town in all manner of colorful attire. In the 1770s, he forged a close professional and personal friendship with the noted upholsterer Betsy Ross, the two of them meeting weekly over tea to exchange gossip and to complain about work, men, and the Intolerable Acts. "It's amazing to think that Nathaniel unknowingly designed the most iconic flag in world history," said Historical Society of Pennsylvania researcher Maxwell Derosiers, who found the journal in the pocket of a period cheetah-print waistcoat in the organization's basement. "From the American flags that flew over Fort McHenry and Iwo Jima, to the one planted on the surface of the moon, every incarnation of the Stars and Stripes traces its roots to this one very gay article of clothing"
"And I mean really gay," Derosiers added. "This was a sleeveless crop top." By April 1776, the weather had grown too warm for the full-body leather outfits that Nathaniel favored in wintertime, and the British naval blockade prevented him from purchasing the imported European silks he typically wore in the summer, Derosiers explained. So he asked Betsy Ross to sew him what Nathaniel described as a "lightweight and super glitzy garment of fine cotton." "I seek to make a bold fashion proclamation and to stand apart from the drab gentlemen of today with their pedestrian wigs, facial powders, and lip rouges," wrote Linsley on April 19, 1776. "Thusly, I met with my darling friend Miss Betsy this forenoon to discuss the design of a new shirt to match my vibrant sensibilities. O! how I look forward to donning the garment anon and jaunting about the town square!" Over the next several days, Linsley consulted with Ross regularly, making several significant alterations to the design, which included adding a blue field on the back side of the shirt for "a little splash of color," demanding ever more spangles, and selecting plain white fabric for the alternate stripes instead of see-through mesh, as he had originally envisioned. By his own account, Linsley wore the shirt everywhere, from his daily trips candle shopping, to attending theater performances, to simply relaxing on the city green where he often watched the athletic young militiamen practice their drills. According to a contemporary clipping from the Philadelphia General Advertiser that Linsley pasted in his journal, Gen. George Washington became mesmerized by the striking garment on July 7, 1776, when he caught sight of the colorfully clad Linsley playing his fife and "dancing a merry cotillion" outside what is now known as Independence Hall. "This resplendently bedecked man, with his pet bald eagle perched on his shoulder, strutted about with unabashed confidence and pride, like America itself," Washington is quoted as saying in the article. "At once, I knew I must make this radiant son of liberty's shirt into a glorious flag o'er our nation!" Historians claimed Washington's appreciation for the flamboyant garment was shared by the whole of the Continental Congress, which soon proudly adopted the shirt as the official standard of the newly established United States. "Thanks to the chance discovery of this diary, we now know that Nathaniel Linsley, a homosexual man, is the true father of the American flag," Atwood said. "And from now on, when we look up at Old Glory flying proudly above, we'll see the very same red, white, and blue that he wore tightly across his chest more than two centuries ago." "Though, lamentably," Atwood added, "without the pricey sequin overlay he so desperately wanted."